From bustling medinas to Mediterranean promenades, nowhere else on Earth will you find such an eclectic mix of Arab charm and French colonial influence. The culture of the Arab World generally dominates, but strong French undertones exist throughout Morocco, Algeria, Tunisia, and Egypt. And French is still the official language of Mali, Chad, and Niger. The resilience required to subsist in this region is what makes its people so unique. Upon visiting, you'll soon discover that beneath the weathered exteriors are friendly, charming and witty personalities. It may take some patience, but that's the Africa we should all experience. The region is well known for its contrasts. The fertile Nile, which is the longest river in the world, drives a wedge right through the hot and arid Sahara. And Egypt, one of the most liberal Islamic nations in the world, sits right between Libya and Saudi Arabia, two of the most strict. The other less fortunate contrast is that of wealth and development. Some of the seaside cities such as Alexandria, Algiers, and Casablanca show a thriving and prosperous North Africa. Whereas others, toward the interior of the region, represent some of the poorest areas on Earth. Despite this, you'll find warm and welcoming people throughout. Fez (or Fès) is an amazing medieval city bustling with old-world charm. It is widely considered the religious and cultural hub of Morocco and is home to the world's oldest university. The city of Fez actually encompasses three smaller walled cities, most notably, Fes el-Bali. The circuitous medina of Fes el-Bali is one of the world's best examples of a preserved old city. Its narrow alleyways, pungent tanneries, and busy bazaars are guaranteed to overwhelm even the most worldly visitors. At the intersection of the Mediterranean and the Sahara, Tunis offers desert sunsets, fresh seafood, and tree-lined avenues. And the real bonus? It's free from the itineraries of tour groups because it lacks sandy beaches and brochure-worthy attractions. The medina is by far the most popular part of the city. This Arab old town, featuring intertwining alleyways with beautifully vaulted alleys, is the historical core of Tunis. Though the French quarter is close by for those needing more space and a café au lait. Even though Alexandria is much smaller than Cairo, it's still one of the most populated cities in Africa. With that said, it feels less African than any other city in the region. Its sobriquet, "The Pearl of the Mediterranean", makes reference to its unusual European demeanor. 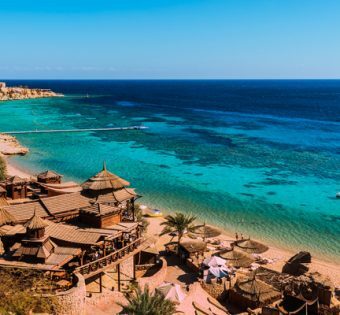 In addition to French influences, Alexandria has a stunning Greek residential quarter and a glistening Corniche, which is oddly studded with rows of casinos and beaches houses on stilts. It often goes unnoticed, but the area is largely free of touts too. As much of a blessing as this may seem, it's oddly unnerving after the incessant prodding from touts in Cairo. You can hot air balloon anywhere in the world, but it's best reserved for North Africa. For starters, you're not just ballooning anywhere, you're floating above soulful places like the Valley of the Kings and Valley of the Queens. There's nothing quite like the sights and sounds of 30 hot air balloons all firing up in the black hours of the morning. The sharp bursts of heat, the explosions of gas, the balloons waiting in anticipation, it all makes for a rewarding and unforgettable experience. Do you remember looking at pictures of far away beach resorts and thinking, "if I relaxed that much, I'd fall into a coma and never wake up"? Well, multiply that by ten and you'll be sailing down the Nile, with an intimate group of friends, on a traditional Nubian Felucca. Feluccas aren't rich with features (i.e. no bathrooms), but imagine floating down the Nile on a giant mattress. There's a lot of reading, chatting, eating, learning about the Nubian culture, and generally just taking it easy. It's a great complement to active experiences like scuba diving, donkey racing, and trail riding. So, you've embarked on a global adventure because you want to develop an edge. You're tired of comfort zones and routines, and so you're now traveling abroad to test your mettle. But despite the grand plan, you're still shying away from the unknown. Want a quick fix? Head to the nearest bazaar and start bargaining like a madman. There's nothing quite as confronting, but there's nothing quite as rewarding either. Let go of your inhibitions, become one with the culture, and enjoy an otherworldly experience. This is the soul of the Arab World. If you want more than sights, sounds, and smells, give the place a good taste test with these must-try local favorites. Thé à la Menthe, that's mint tea in French, is enjoyed in the bazaars, cafes, and homes in North Africa. It's especially popular in Morocco where the sight of it being poured, from almost a meter above the glass, draws stares from curious visitors. Moroccan mint tea is quite tasty too. Firstly, because the tea leaves are cleansed in hot water beforehand to remove excess bitterness. But more likely, the great taste is the result of adding five teaspoons of sugar and stirring. You can't travel through the Middle East without an introduction to the shisha. It's as ubiquitous as beer in Ireland, BBQ in Australia, and the baguette in France. But unlike cigarettes in the West, the Shisha is engrained in the North African culture. The mere sight of groups of men, relaxing in cafes, and smoking shisha, is enough to turn even staunch non-smokers into enthusiastic pipe-tokers. That is until they feel the crash of the thick smoke against the back of their throats. But a few tokes is all it takes for an authentic taste of North Africa. Falafels in North Africa are like hamburgers in America; they're everywhere and they're tasty. Even McDonalds sells the cleverly named McFalafel. But you don't go to Maccas for an authentic falafel, you go to the street-side vendors who sell them for a pittance. There are two words of warning though. Firstly, be careful with the accompanying salad; sensitive stomachs may react violently to the water that is used to wash it. Secondly, falafels are deep fried in oil, so they're about as healthy as hamburgers too.